Going to the movies this weekend? We’re now making it easier for you to make plans while you’re on the go. When deciding what movie to watch, you usually consider the movie itself along with the showtimes and theater options. With our latest update rolling out today, you can quickly compare movies by the factors you care most about—ratings, showtimes, theater location and more—all from the same view. And just as before, you can easily buy your tickets in advance; just click on a showtime to purchase a ticket. 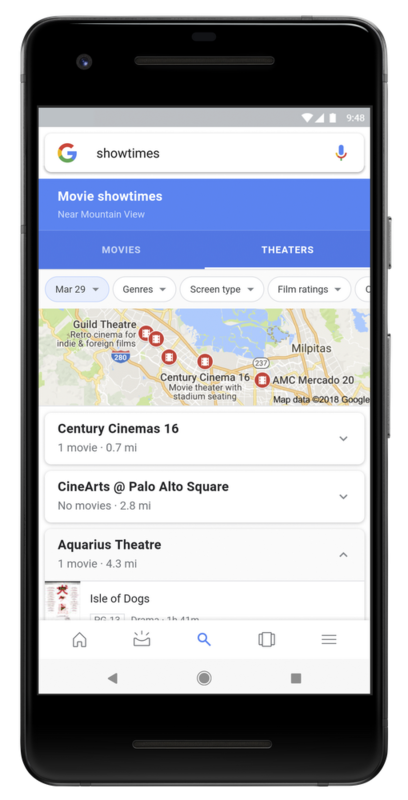 To try this out, search for “showtimes,” “movies” or movie times in your city such as “Mountain View showtimes.” This feature is available on Google Search in mobile browsers and in the Google app for Android, in the U.S. and India in Hindi and English. It will come to the Google app for iOS soon.